President of Kosovo says his country would open an embassy in Jerusalem if Israel recognizes it as an independent state. The President of Kosovo says his country would set up an embassy in Israel if the Jewish state recognizes it as an independent state, JTA reported Friday, citing the KosovaPress agency. 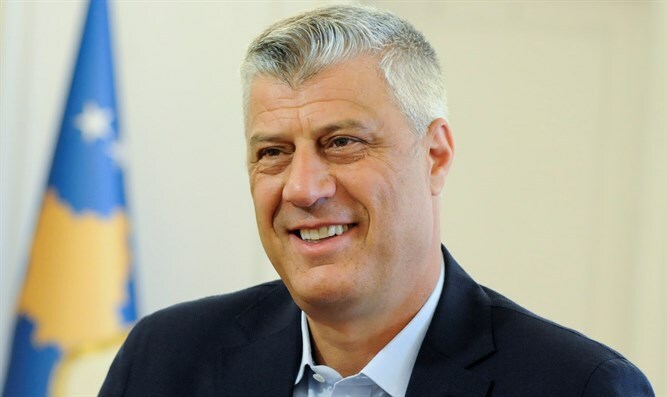 The President, Hashim Thaci, made the comments during an interview which aired on Thursday on a local news show. “If Kosovo were recognized by Israel, I would place the Kosovo embassy in Jerusalem,” Thaci was quoted as saying. Opposition by Russia and China have kept Kosovo from getting UN membership, however. Israel, Spain, India, Morocco and Ukraine are among the key countries that have not recognized Kosovo, reportedly out of opposition to unilateral declarations of independence, including in territories they control. The United States relocated its embassy in Israel from Tel Aviv to Jerusalem in May. Guatemala also moved its embassy to Jerusalem two days after the US move. Prime Minister Binyamin Netanyahu has urged repeatedly a number of countries to follow the US example in May and move their embassies to Jerusalem. Czech leaders recently endorsed moving the country's embassy in Israel from Tel Aviv to Jerusalem, a move that that had been encouraged in the past by the country’s President, Milos Zeman.